After two months of negotiations, I'm pleased to announce that a Sefer Torah has been transferred to The Sefer Torah Recycling Network for repairs and placement in the Givat Nof Harim hilltop community of Yishuv Eli in the Shomron. The Sefer Torah Recycling Network wishes to thank the Goldstein family of Queens, NY for the great Mitzvah of placing a Sefer Torah in a needy location in Eretz Yisrael. Video coverage of the Hachnasat Sefer Torah event is now available on the IsraelNN web site. There are three separate files for "Israeli Salad #37"
a while for the program to finish loading. On Friday, 30 January, 2004, I travelled via autobus #474 and arrived on about 2 PM in the afternoon. My contact, Yo'av Amir, the Shul's Gabai, picked me up at the Kikar at Yishuv Eli's main entrance. After a cup of tea, he took me on a tour of the neighborhood as well as a driving tour of the hilltop communities which surround the main Yishuv and which are part of the Yishuv. The views from the Givat Nof Harim are fantastic. From there, you can see the surrounding Yishuvim -- Ma'alei Levona, Shilo, Shvut Rahel and even Tapuach. I took numerous pictures during Friday afternoon of the view from the hilltops, the Main Yishuv, the Beit Knesset -- inside and out, the Gan and a converted railroad car which serves as a visitor's center and is located between the main Yishuv and the hilltop communities. I received wonderful, warm hospitality (and great food) throughout Shabbos, having my meals with 3 different families -- Friday night with Yo'av and his wife and baby, Shabbos lunch with a another member of the Shul's Va'ad and Seudat Shlish't with a 3rd family. The community is extremely warm, close-knit and very S'niyut. Davening was nice and the Rav ( Rav Mordechai Haas) is soft-spoken, s'niyut, yet a big Talmud Chacham. Rabbi Haas teaches during the week in a Yeshiva in Jerusalem. He makes himself available throughout the week, via cellphone, to answer Shi'alot for not only the Givat Nof Harim community, but of the entire Yishuv. He gives a Shiur on Friday night after Davening as well as on Shabbos morning before laining and just after Mincha for about 20 minutes. I'm told that Rabbi Haas and his Rebbetzin have 12 children. The people in Givat Nof Harim are serious in their learning. Discussions throughout Shabbos were very stimulating. The people are, for the most part, young in their 20s and 30s, yet very grounded, mature, serious and sincere. 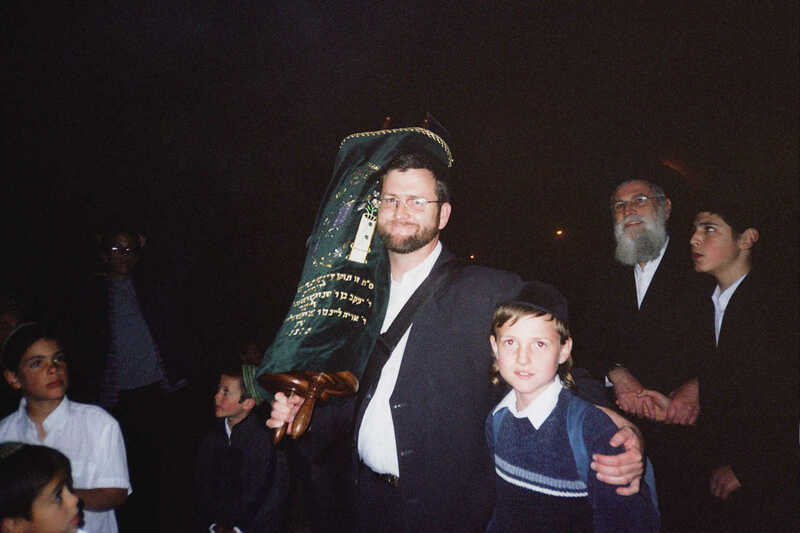 The Rav has lived in Eli for 7 years and was among those who began the community. And when he moved to the community, he brought others to the community as well. The Rav spent his childhood in "Bnai Brak" and then learned at "Mercaz-Harav". The Shul was built within the two years. It is nice, although not fancy. The people live simply and with S'niyut and the Shul is in keeping with their derech. Yishuv Eli & Arab village in the Valley. Yishuv Eli, Arab village in the Valley & Gazaebo. The Givat Nof Harim neighborhood Gan. Entrance to the Beit Knesset of Givat Nof Harim. The Beit Midrash from the outside. Inside the Beit Midrash and Yo'av Amir, the Shul's Gabbai. For the convenience of all donors, you can now donate on-line through the use of using your paypal account and/or your credit card. Please enter email account <mosheb@sefer-torah.com> when making your donation. Sefer Torah, Sifrei Torah, Sefer Torah Recycling, Sefer Torah repairs, Torah scrolls, Torah Scroll Restoratation, Sefer Torah restoration, Sefer Torah transfer, Israel, Eretz Yisrael, Mokom Torah, Mekomot Torah, chessed, mitzvah, tzedaka, donations, memorial donation ideas, Jewish memorial donation ideas, raise funds, Shuls, Israel, Eretz Yisroel, Yeshivas, Yeshivot, Israeli Yeshivot, chizuk, Ahavat Yisroel, Sofer, Sofrim, Sofrus, Synagogues, Synagogues in Israel, Beit Knesset, Israeli Batei Knesset, Israeli cities, Israeli towns, needy locations in Israel, Memorials in Israel Mission: Acquires donations of Sifrei Torah and raises funds to restore them to a Kosher state for transfer to needy locations in Israel., Philanthropist, philanthropy, philanthropic, Philanthropic "Angel"